Diners in the Tampa Bay area are invited to take part in a special dining promotion designed to showcase the bounty of the strawberry season. 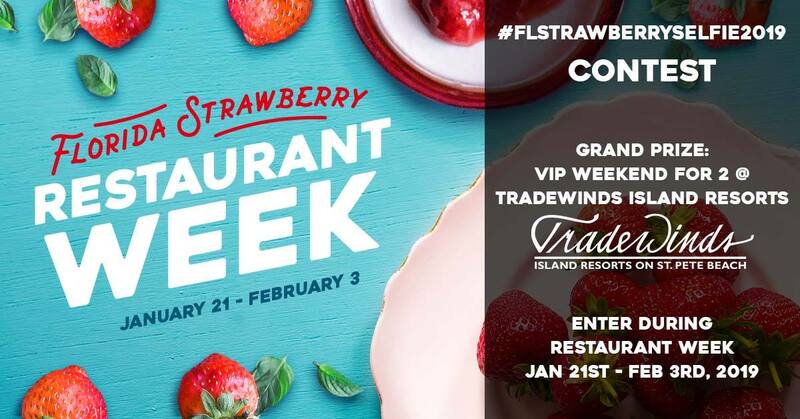 Florida Strawberry Restaurant Week 2019 is encouraging diners to take selfie pictures with the juicy fruit to share and compete for prizes. The contest is sponsored by the Florida Strawberry Growers Association partners in an effort to show appreciation for this delectable fresh fruit. The promotion and contest is currently running until February 3. Select restaurants in the area have been chosen to showcase recipes that include strawberries. These special menu offerings will only be available for a limited time, enticing diners to come in and enjoy the sweet goodness while it lasts. Diners can visit any of the participating restaurants and then order one of the special strawberry dishes. After taking a selfie with the menu item, the picture needs to be posted to Facebook, Instagram, or any other social media account of the participating restaurant. The photo should be tagged with #flstrawberryselfie2019. Each social media post will reward the poster with points to put toward the contest. The grand prize winner will receive a VIP weekend for two at the TradeWinds Island Grand Resort and an additional $500 in restaurant gift cards. The second place winner will receive $400 in restaurant gift cards. This contest is open to legal residents of the United States ages 21 and older. All of these fantastic restaurants are delighted to incorporate strawberries into the seasonal menus, offering up a cornucopia of innovative new dishes and beverages designed to satiate any appetite. Check out our video from when our reporter Jill Conway tried some of these gorgeous Florida Strawberry Restuarant Week dishes! Now is the time to make your plans to participate in this unique contest while you enjoy a bevy of delicious dishes!